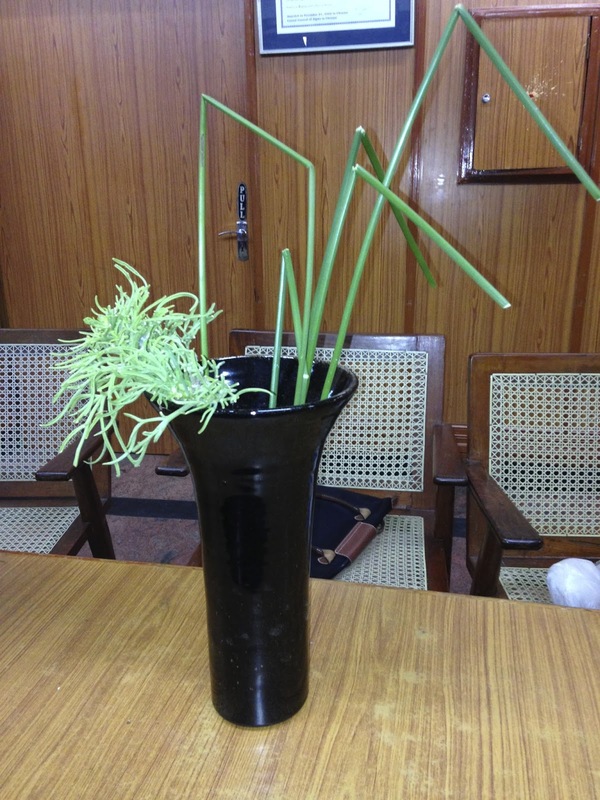 Our October workshop was on working with unusual materials or vases and creating abstract compositions. 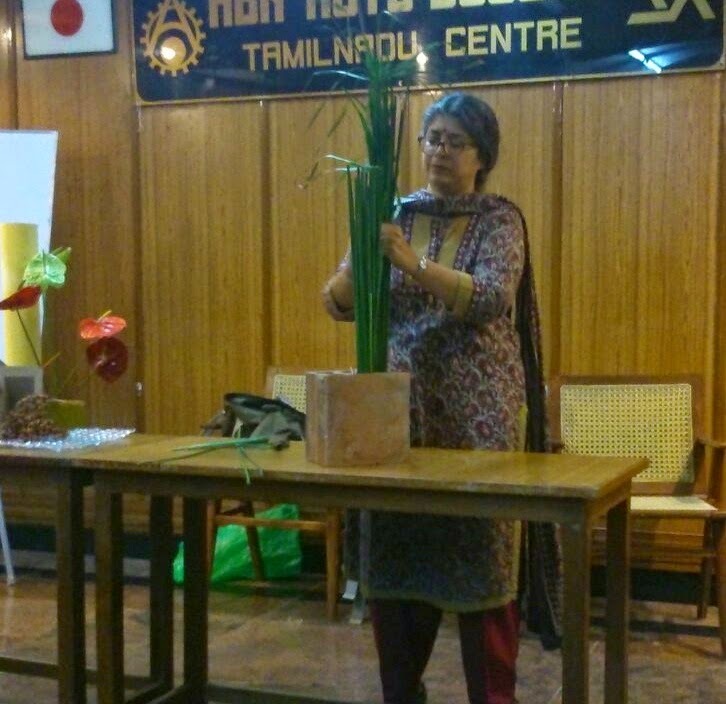 Ambika demonstrated a couple of arrangements before the assembled members tried their hand at it. 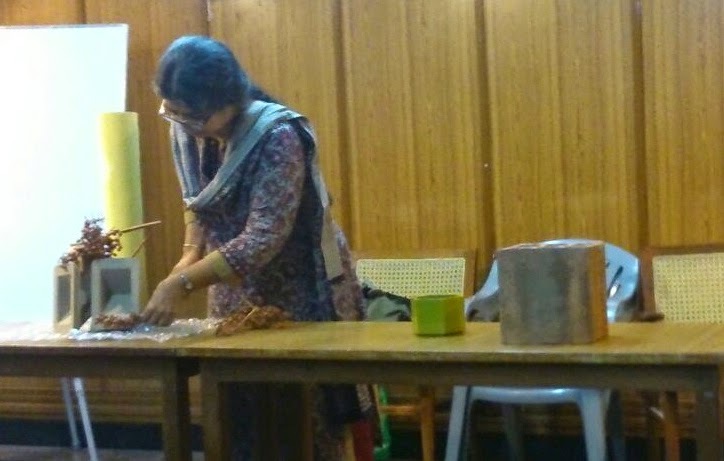 It was an exciting and invigorating workshop, with a wide array of material and containers. 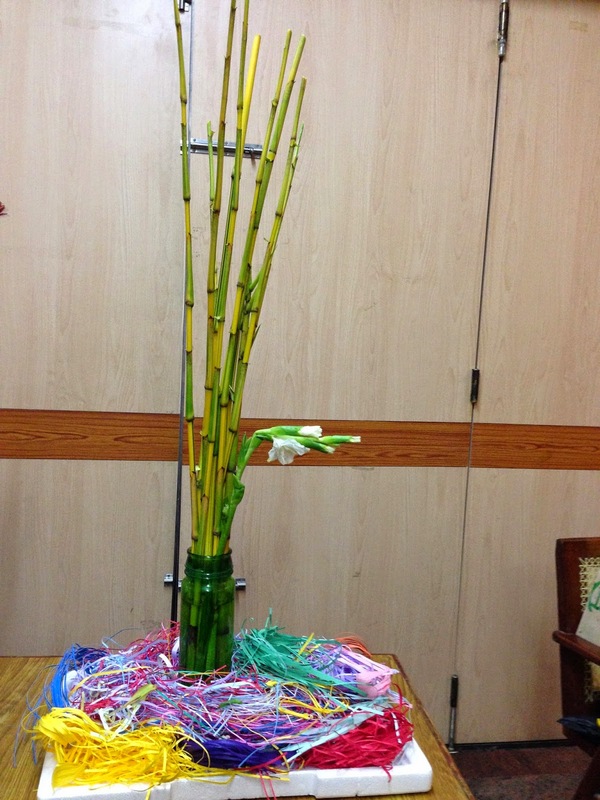 Ambika's first arrangement, seen below, was with four bits of packing material (soe), that she rested on a bubble wrap sheet. The strong shin was provided by a roll of chart paper discarded by her son! 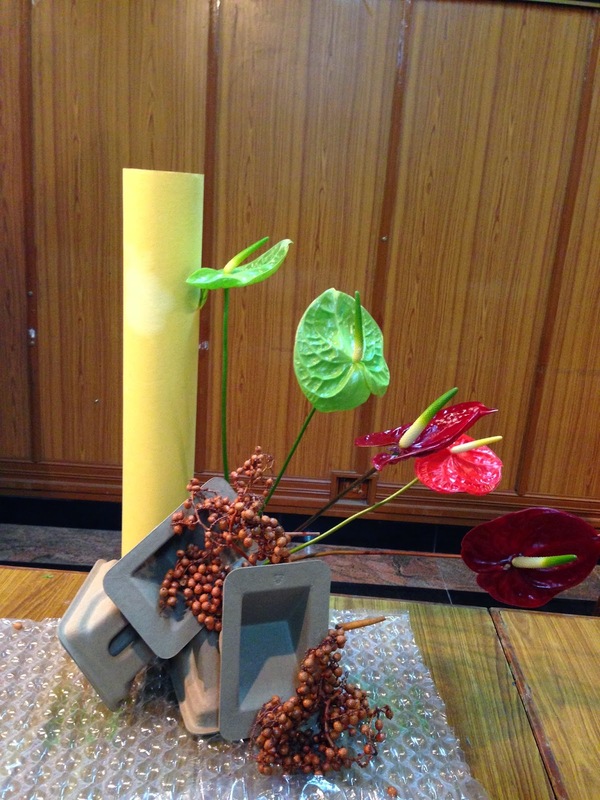 The hikae anthuriums and the jushis coloured seeds added to colour to the composition. The second arrangement was created in a machine-cut hollow brick, which had an interesting texture, as well as six spaces created by the structure of the brick. 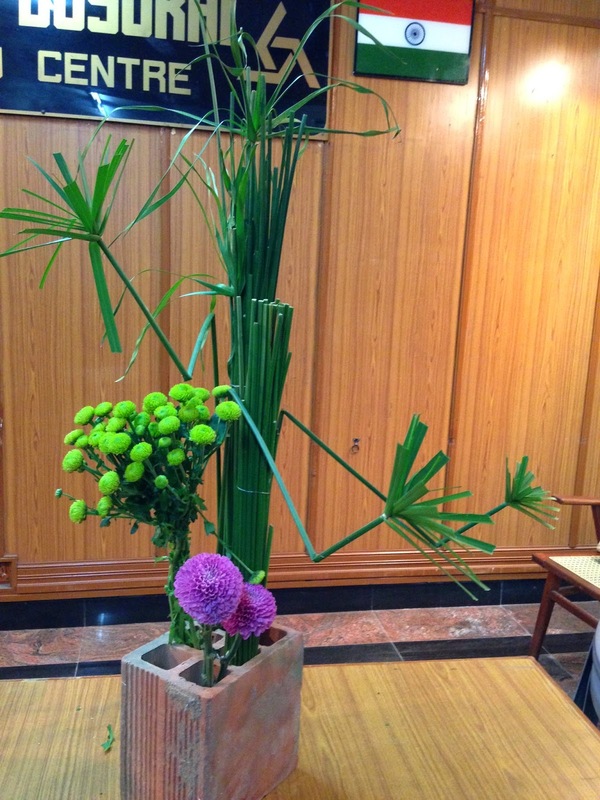 Umbrella plant was amassed as two heavy lines, while the purple and green chrysanthemums were also massed for colour. 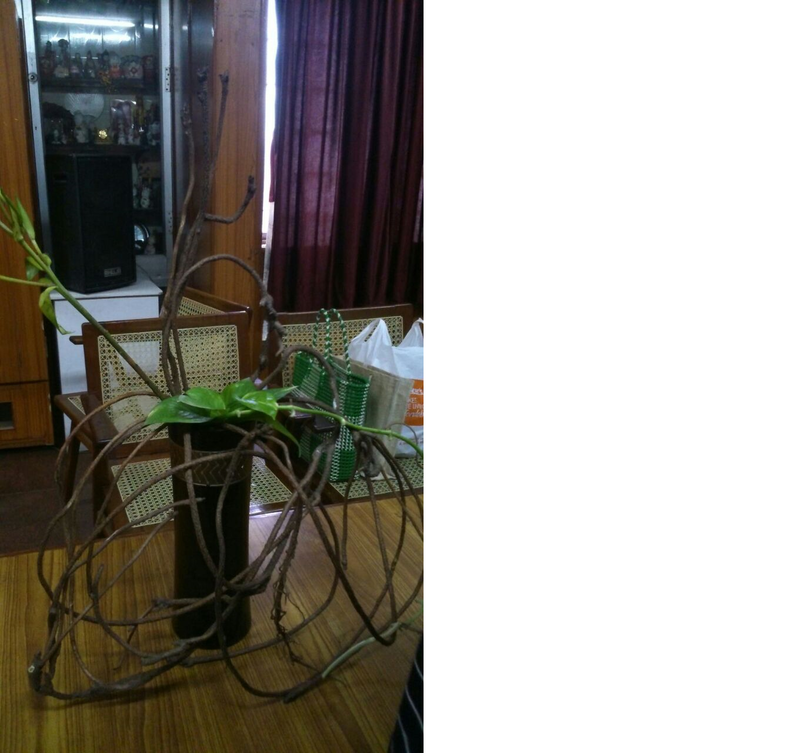 In order to provide depth, a few of the umbrella plant stcks were bent into angles. At first they were arranged with a single downward bend, then sensei Malathi suggested that an upward second bend would make it more dynamic and alive, and what you see below is the final result. The arrangements that followed were dramatic and exciting. 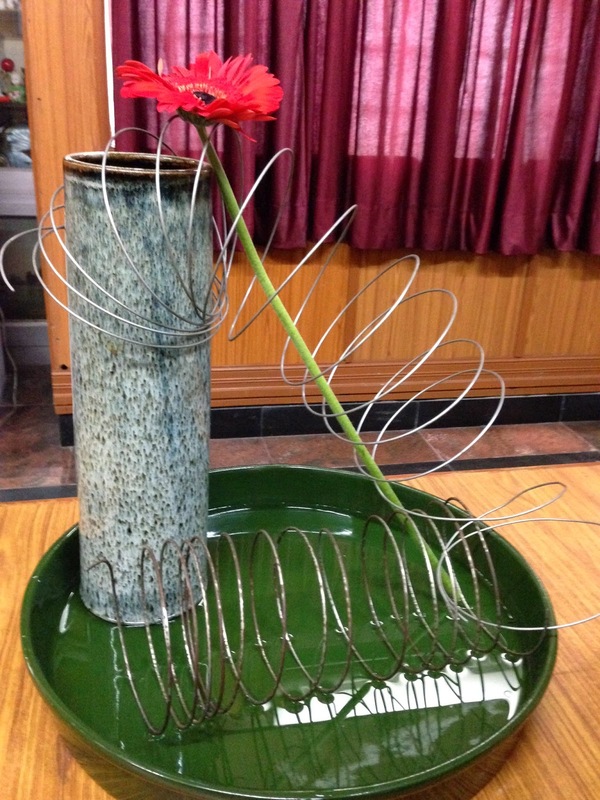 By Prerana - "Freedom" - steel wire, encasing a single jerbera, a ceramic nagere vase resting in a fibreglass moribana plate. An example of minimal material and maximum efect! By Prerana - "Firecracker". Clothes clips, a cycle tube, a single jerbera on a self created wrought iron framework. Dramatic and colourful! 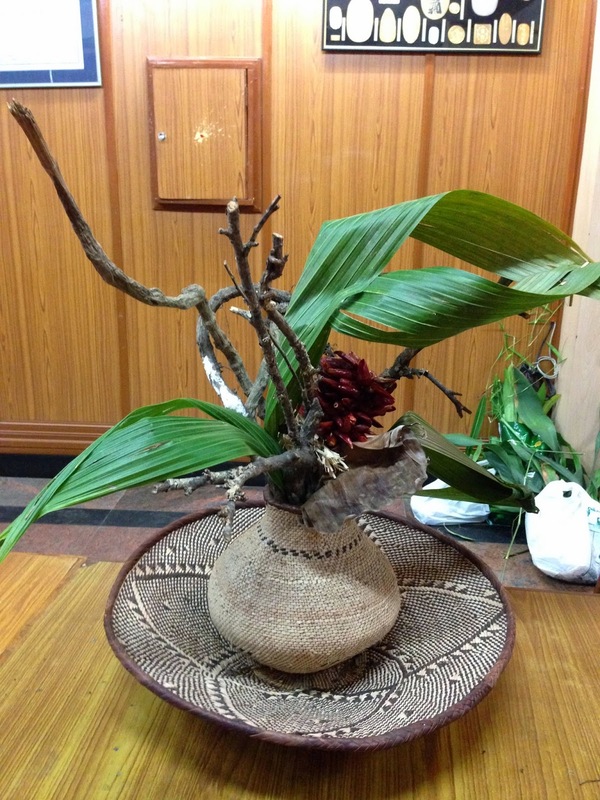 By Sensei Molly - a basket with material from her garden, offset with wire. Simple materials used for beautiful effect. Could we call it "Still Life"? 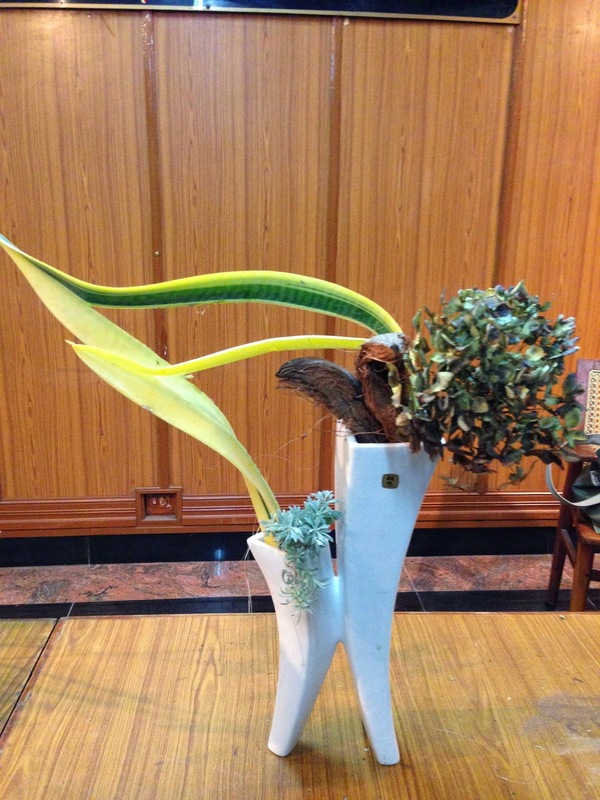 Sensei Malathi - A sogetsu vase, with a drief hydrangea, san savera leaves, coconut husk and lavender leaves, make for an interesting arrangement, which I shall title "The Dancer"
Kalpana used a sheet of thermocol, and created the effect of a drawing, with a single jerbera head and a palm leaf. "Vishnuchakra!" 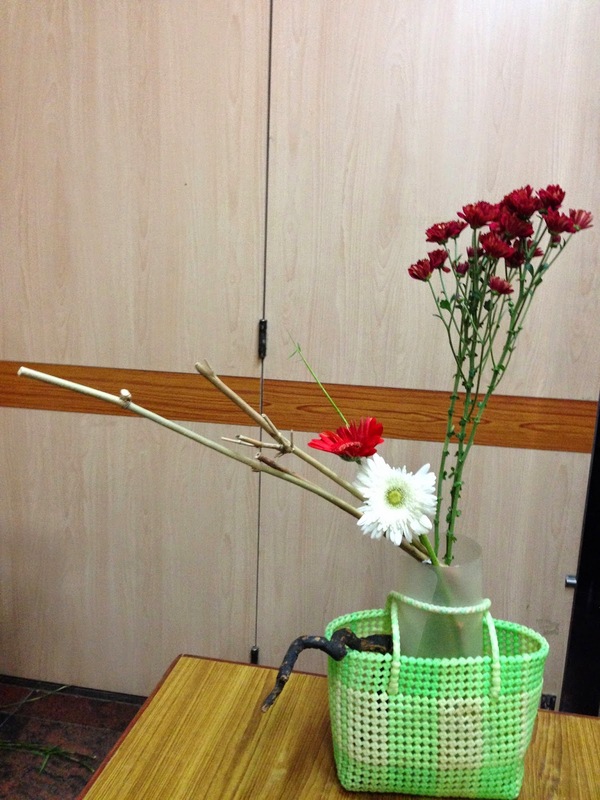 Trishala experimented with her shopping basket, and I am tempted to call this "Off to the market"
Pushkala added colour with packing material used at the base, to offset the green vase and linear stalks. 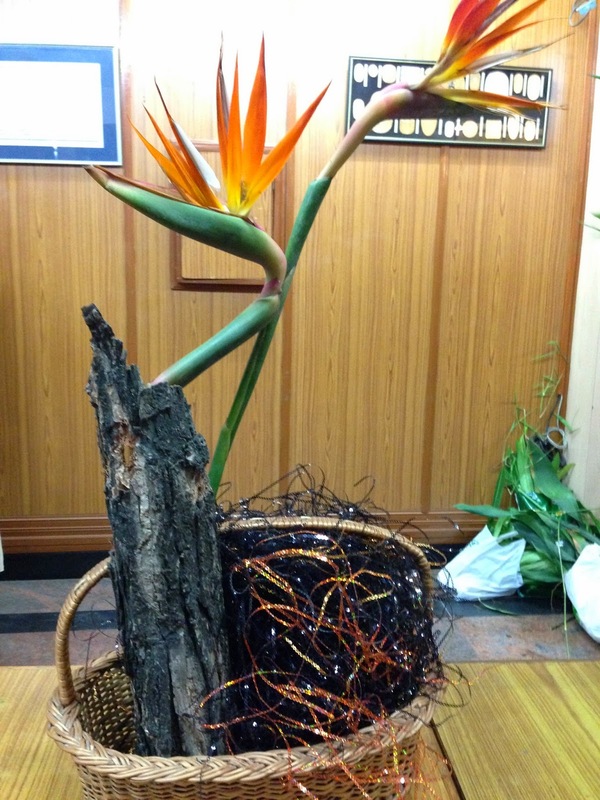 "After the party"
Chelvi complemented the browns in her basket, driftwood and mass, with a couple of dramatic strelitzia. 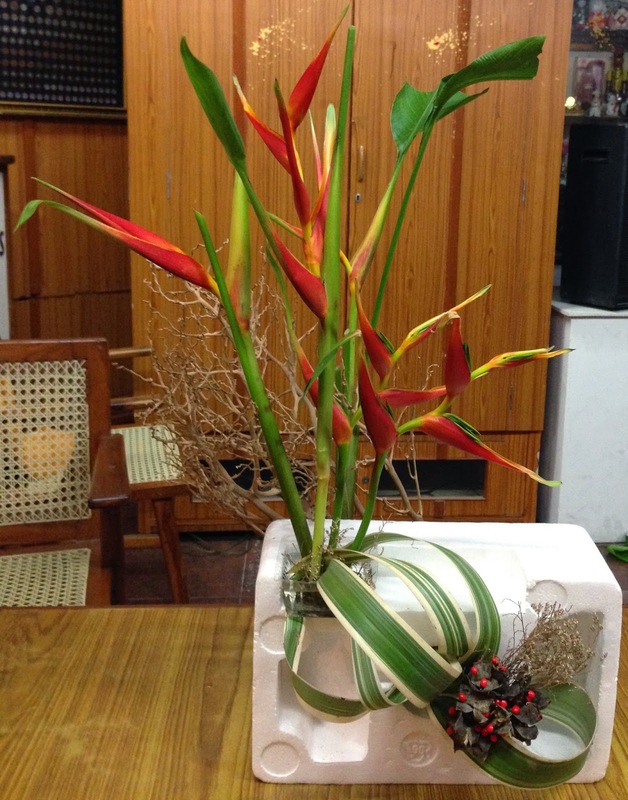 "Birds"
Chitra used heliconia to cheerful effect in a piece of thermocol packing that had an interesting shape! 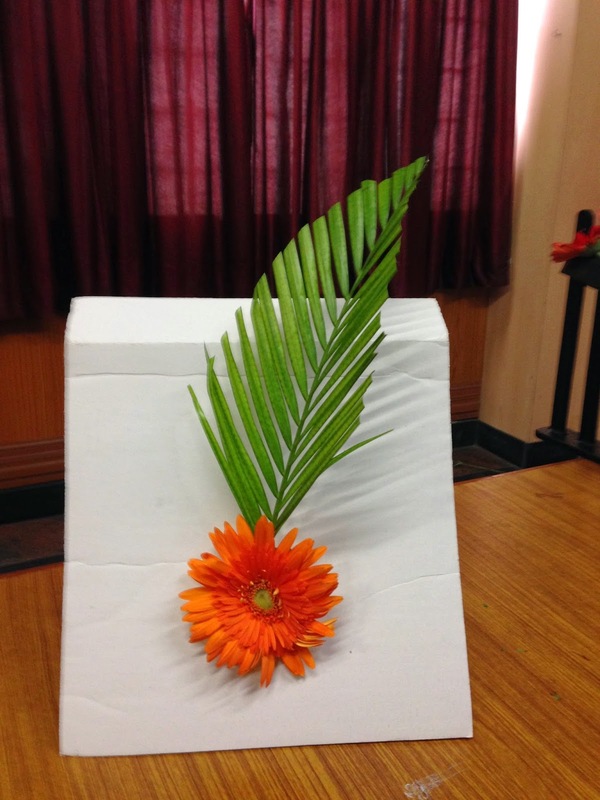 "Festivity"
Divya created a mass with the interesting fern, and offset this with the dramatic lines of the umbrella plant in a tall nagiere vase. "Untitled"
Would you like a different title for the compositions? Next month is exhibition time, amnd the group will get together to plan. Best wishes for a safe and happy deepavali to all!